Check out this awesome Arctic Cat commercial for the 1977 Pantera. Do we Midwesterners really talk like that? The movie Fargo, anyone? Getting a new snowmobile makes each of us feel mighty good. Like Henry. 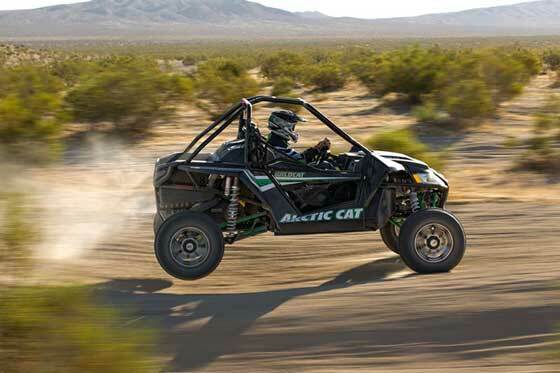 Yes, the new Arctic Cat Wildcat lands softly, as evidenced by a few jump sequences captured in Barstow, California. Snow Depth for 12.9.11: C'mon Mother Nature! 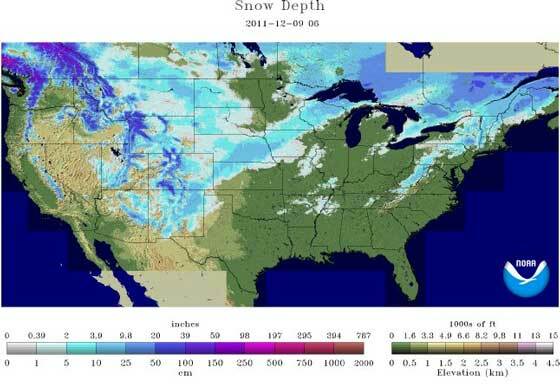 Here's the snow depth report from NOAA for Friday, Dec. 9, 2011. I know it's pretty normal for this time of year, but I'm not happy. C'mon Mother Nature, bring us some snow! Four-time Eagle River World's Champion P.J. 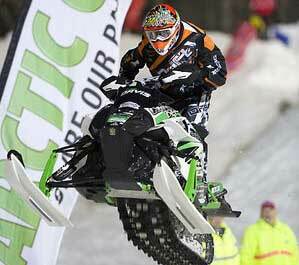 Wanderscheid is gunning for a fifth title this year aboard an all-new Champ sled. 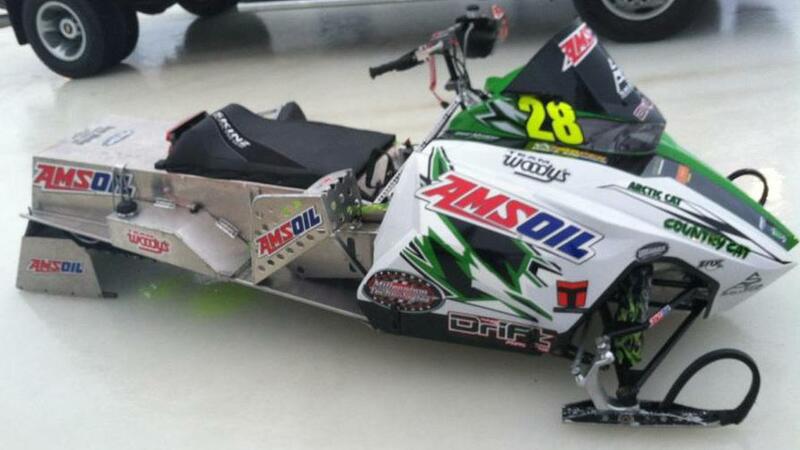 Here are a few pix of the machine prior to him racing at the season opener in Beausejour, Manitoba, last weekend. Why does this guy look so dour? 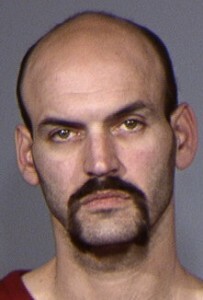 For starters, he's a likely felon. He's also soaking wet, and his wallet smells like carp. But worst of all: He was betrayed by his 10-plus-10-equals-20-inch-Handlebar-Riser. How bad was the race season opener? Why? And what should we expect in the coming months? I have a few thoughts to share. 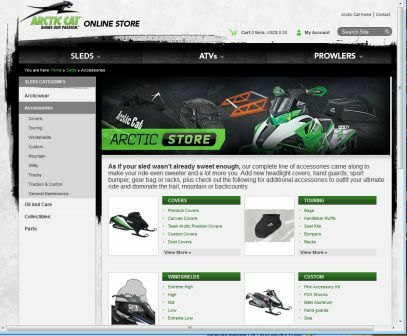 Buying Arctic Cat parts, accessories, oil and clothing in Canada is now just a few clicks away. Click to read the press release announcing E-Commerce in Canada. 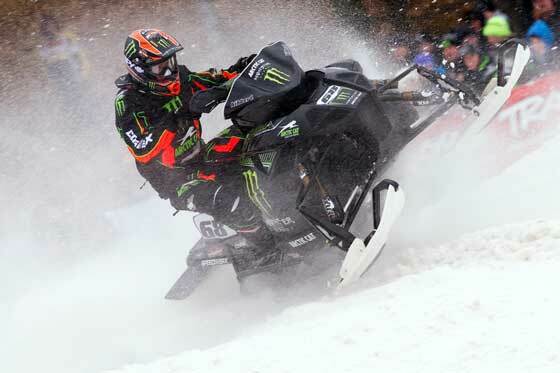 Check out another great video, this one produced by Tucker Hibbert and crew, detailing how the Duluth snocross race went (plus talking about the whole season). Check out this excellent video from Flying A Films of Team Arctic snocrossers and engineers testing the 2012 Arctic Cat Sno Pro sleds the week after the Duluth Spirit National Opener. CLICK HERE for more Flying A Films. 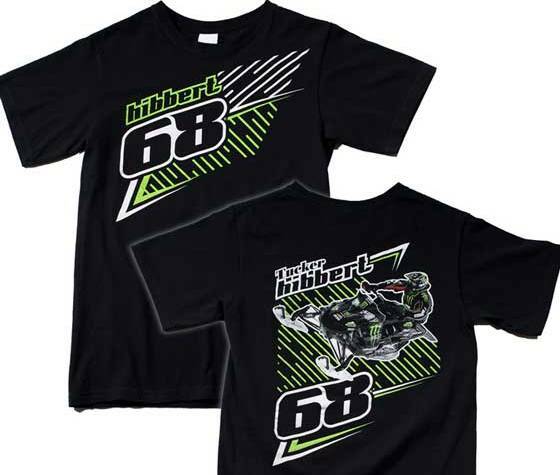 Tucker Hibbert just released his offical line of 2012 merchandise. Lots of cool items. Click to see a few of the newest goodies. Arctic Cat engineer Kevin Thompson has played key roles on iconic sleds ranging from the ZR to the new ProCross/ProClimb. Thoughtful, articulate and able to draw upon a wide-range of experience, Thompson gave some great answers to a bunch of questions I recently asked. Click to read the interview. 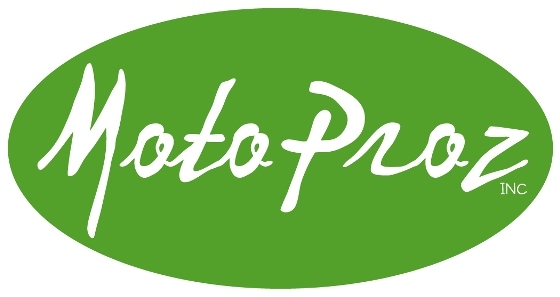 MotoProz (formerly Kelly's Sales) in Mazeppa, Minn., is hosting their Annual Open House. Click to check out the info. Christian Bros. 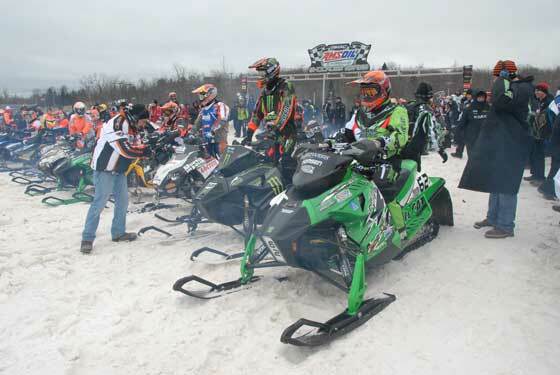 Racing kicked off the 2011-12 race season at Duluth, where the team showed it's ready to overcome injury. A few days prior to the Duluth Snocross, Kirk Hibbert's shop gave birth to the newly-wrapped #68 Monster Energy/Arctic Cat Race Semi. Even better, though, is that Kirk's dog Curly got a Scoobie Snack. Woof! Want to know how rivalries sometimes develop? They begin with little love-taps, brake-checks and bermshots. 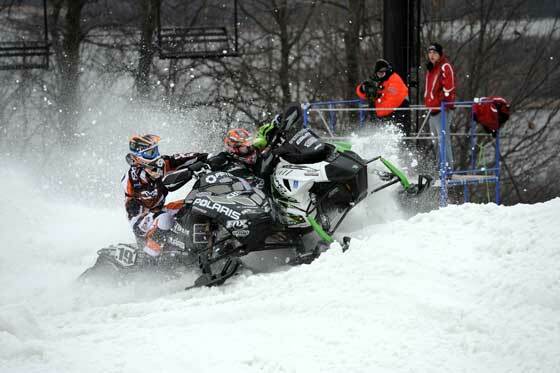 In this heat race at Duluth, Team Arctic's Dan Ebert gets booted over the berm by Polaris racer Brett Bender. Click to see the photo sequence. 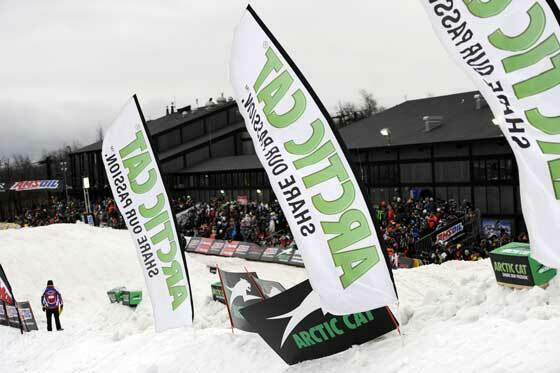 While the Duluth Spirit National Snocross opener wasn't the usual win-everything event for Team Arctic, there was still lots to see and learn. Click to see what I gathered. While it wasn't the weekend that Tucker and team wanted to have at the Duluth Spirit Mountain snocross opener, he is second in points. Click to read the press release from Team Hibbert. I was going to write this report about the new 2012 Arctic Cat Wildcat a month ago, when I’d just gotten out of the driver’s seat following a full day’s ride in Barstow, Calif.
Click to read my ride report. 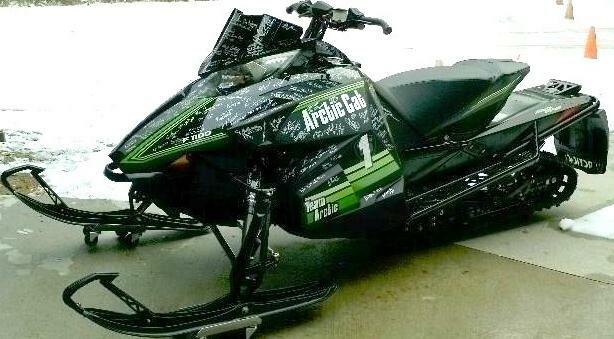 Bidding has begun for 2012 Arctic Cat F1100 50th Anniversary snowmobile signed by 230 Team Arctic racers, to benefit the Snowmobile Hall of Fame. 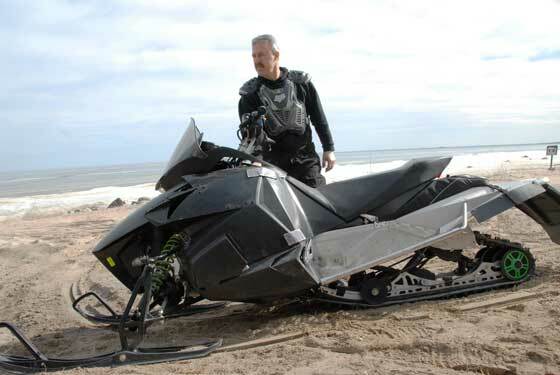 As I write this, the sled is yours for just $14,050! CLICK HERE TO GO TO THE EBAY AUCTION. 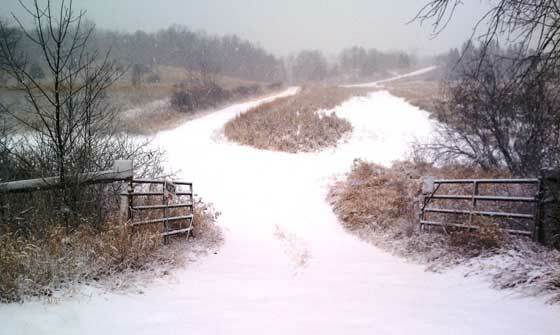 This past weekend, the first snow fell (where I live) this snowmobile season. Enough to make some tracks.